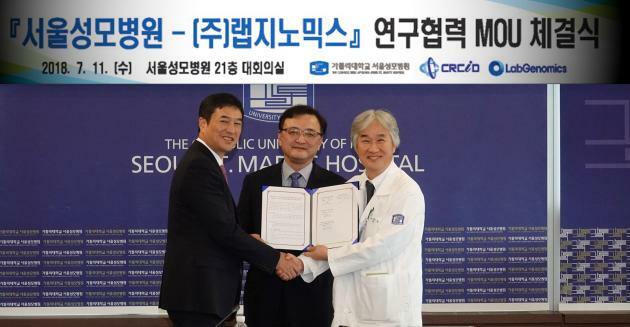 The Catholic University of Korea St. Mary's Hospital said Wednesday that it has signed a memorandum of understanding with Labgenmoics to research predicting organ transplant rejection response jointly. Through this agreement, both institutions expect synergic effects on constructing a new model for organ transplant rejection response and the reorganizing the treatment guidelines for organ transplant patients. Professor Kim Se-woong (right), head of research at St Mary’s Hospital, and Labgenmoics CEO Chin Sung-hyun shake hands after signing the MoU at St. Mary’s Hospital in Banpo-dong, Seoul, Wednesday. Labgenmoics is a molecular diagnostic healthcare company that developed the first NGS (Next Generation Sequencing)-based analysis software in Korea and obtained ISO 13485 certification. The Ministry of Health and Welfare has recently designated the company as an official center to receive a histocompatibility antigen test for those wishing to donate their hematopoietic stem cells. The hospital expects to spur research in their organ transplant center, which has recently achieved 1,000 cases of liver transplantation, through research collaboration with Labgenmoics. The company plans to provide specialized services for patients with intractable blood diseases by accumulating liquid biopsy technology based on its previous experience on refractory disorders. Labgenmoics also showed their expectation to work with St. Mary’s hospital.